You may visit any of the Tax Office Branches and/or Full Service Contracted Offices and a representative can tell you if the title being signed over to you is correct and if it has any salvage or legal issues. Make sure the private individual selling the vehicle, their name is on the face of the title and properly assigned to you on back of title on the first assignment. If it is not, then you will need to contact the Texas Department of Motor Vehicles to obtain instructions as to how to properly title and register into your name. To apply for title and registration, the following documents are to be submitted to any of the County Tax Office/Branches or Contracted Offices within 20 working days from the date of sale to avoid penalties. Not titled/transferred within 20 working days, application is subject to delinquent transfer penalties of $25 if filed on the 31st day after the date of sale; and an additional $25 for each subsequent 30 day or portion of a 30 day period, not to exceed $250 (except military, delinquent after 61 days). Original title or registration receipt (if from a non-title State). Title must be properly assigned to buyer. Signed Form VTR-130U (Application for Texas Title) must be signed by the seller and buyer, plus any other supporting documents, such as a release of lien or power of attorney (if applicable). Proof of liability insurance (Must meet Texas minimum requirements (30/60/25). The Vehicle Inspection Report (VIR), which is proof of the State Vehicle Inspection. To obtain a copy visit www.mytxcar.org (if required). If the vehicle being purchased was last registered or titled outside the State of Texas, it must pass a Texas Safety Inspection and the vehicle identification number must be verified by a TXDPS authorized safety inspection station before applying for Texas title and/or registration and submit original VIR. Weight Certificate from a certified weight station if the vehicle is a commercial vehicle in excess of one (1) ton (exceeding 10,000lbs), trailer or semi-trailer. Fees due at the time of filing. 6.25 percent Sales Tax will be based on either the Bill of Sale or the vehicle’s Standard Presumptive Value, whichever is the higher amount. All other vehicles please contact the Tax Office or any of its branches/contracted offices for fee costs. Purchases from Texas Licensed Dealers: If buying a vehicle from a licensed motor vehicle dealer, by Texas law, the selling dealer is required to complete and file all documents necessary to transfer title to the motor vehicle and/or register the motor vehicle in the name of the purchaser within 30 days from the date of sale. In addition, the dealer must collect and remit any applicable sales tax to the County Tax Assessor-Collector's Office. Make sure the dealer provides you with a Title Application Receipt showing the vehicle has been titled in your name. Should you encounter a problem with the dealer not complying with this requirement, please contact the Enforcement Division at (915) 771-2332 for assistance. NOTE: No later than the fifth day after the date the Texas Department of Motor Vehicles receives an application for a title from the County Tax Office, will a title be issued to the first lienholder or to the applicant if a lien is not disclosed on the application. 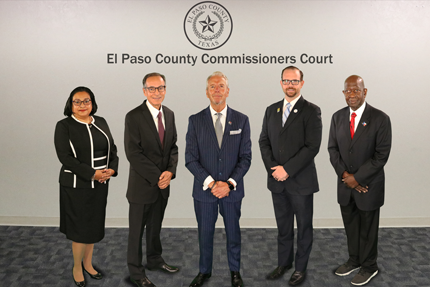 If you have not received your title within 30 business days, please contact the El Paso Department of Motor Vehicles Regional Service Center at (915) 594-6000. Title must be in seller's name listed on front of title document. The seller must complete the first assignment of the back of the title to the buyer. All information must be completed on the assignment: printed name of buyer and address, current odometer reading, date of sale, signature and printed name of seller is required. Complete Certification Section on Form VTR-130U (Application for Texas Title and/or Registration). Indicate Sales Price on line #37(a) of the Form VTR-130U (Application for Texas Title and/or Registration). Provide original title document and Form VTR-130U (Application for Texas Title and/or Registration) to seller. NOTE: You have the option to keep your license plates and transfer them to another vehicle you own; however, you must notify the County Tax Assessor-Collector in person. It is advisable to complete a Transfer Notification Form (Form VTR-346) and submit to the TXDMV within 30 days of the date of sale to help protect yourself from liability for criminal or civil acts involving the vehicle(s) and the buyer(s). It is advisable to accompany the buyer to the County Tax Office or Contracted Office to ensure transfer is completed and thus releasing you of any liability after the fact. The current title or registration receipt from the non-titled state where vehicle was last titled/registered (Or MCO if a new unregistered vehicle). If the ownership and description of a vehicle cannot be determined or there is doubt regarding information on a foreign document, a translation into the English language is required. The translation must contain a notarized or acknowledged affidavit from the translator, including the name and address of the translator. * If importing from another country, vehicle must pass U.S. DOT safety and EPA emissions requirements, in addition to clearing U.S. Customs must obtain a USDOT Form HS-7 or a US Customs Form 7501. Step 2 - Complete an Application for Texas Title and/or Registration (Form 130-U). Step 3 - All vehicles must pass a Texas Safety Inspection and the vehicle identification number must be verified by a TxDPS authorized safety inspection station before applying for Texas title and/or registration. Therefore, must obtain and submit an original Vehicle Inspection Report (VIR) issued by a Texas State vehicle inspection station, OR complete and submit a Vehicle Identification Number Certificate (Form VTR-270). Step 4 - Vehicle Inspection Report (Form 68A) is required and may be obtained by contacting the Enforcement Division @ 771-2332 to schedule an appointment. Step 5 - Proof of military service or Leave and Earnings Statement (LES). Step 6 - Obtain insurance on the vehicle that meets the state’s minimum requirements (30/60/25). "No fault" insurance is not valid proof of financial responsibility in Texas. However, proof of financial responsibility from out of state or out of country is acceptable if the insurance company is licensed to do business in Texas and reflects the above minimum amounts. You will be required to furnish the declarations page for registration purposes. • Driver's license or state identification issued by a state or territory of the U.S.
• Taxes: Military personnel moving to Texas owe either the motor vehicle use tax or the new resident tax. OR, you may provide a copy of your PAID Tax Receipt IN YOUR NAME of sales tax paid in another state in order to determine the proper sales tax due and/or credit. North Atlantic Treaty Organization (NATO) foreign military personnel, their dependents and military-employed civilians in affiliation with NATO, are exempt from the motor vehicle sales and use tax. New Texas residents---is any person moving into Texas with the intent to live or located within Texas. The new resident who has purchased a motor vehicle outside of Texas and brought into Texas by the new resident is required to register the vehicle within 30 days of becoming a Texas resident and/or establishing gainful employment. This is in lieu of the 6.25 percent use tax imposed on a Texas resident. • Application must be filed within 60 working days from the date of Texas purchase or first use in Texas to transfer title and pay registration fees on the purchase of a used motor vehicle to avoid late penalty fees. Upon the expiration of such plates, must obtain license plates from either the state of legal residence or from the State of Texas. U.S. military personnel returning from Foreign Service will be permitted to operate vehicles in Texas displaying license plates issued by the U.S. Armed Forces or the host nation for a period of not more than 90 days after the date on which the vehicle returns to this state. Military personnel returning to Texas from separation from military service must obtain Texas registration within 10 days following the effective date of such separation. Texas Legislature has approved the creation of 47 new military license plates which will have new designs and feature military emblems. These new plates recognize veterans' combat and non-combat era service and will display the award that the veteran received. Please click on the poster above to access the web page with the full list of military plates available. Select your plate of choice to view the fees, application, and instructions on how to apply for the selected license plate. Complete the required application and submit to one of our four County Tax Assessor-Collector Branch Offices along with your DD-214. 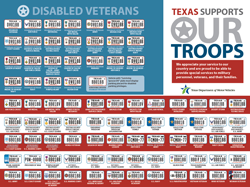 Texas residents, who are veterans of the U.S. Armed Forces, and who, because of military service, receive compensation from the Federal Government for a service-connected disability of at least 50% or at least 40% due to the amputation of a lower extremity are entitled to receive Disabled Veteran (DV) license plates. The fee for the first set of DV license plates is $3 (no annual registration fee required). 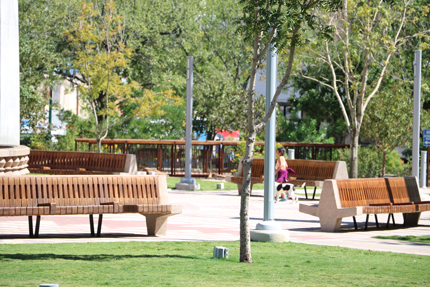 Additional sets may be obtained for the regular annual registration fee and other applicable fees as required. These plates may also be personalized with up to four characters for an additional $40. Vehicles display such plate, must be used for the veteran's own personal use and: Titled in Texas, or issued an RPO in the name of the veteran (joint ownership is allowed). If titled in a name other than that of the veteran, the veteran must have the legal right of possession and control of the vehicle; and it must operate for the veteran's own personal use. If the veteran has a leased vehicle, the county will verify the lease agreement. The words “Disabled Veteran U.S. Armed Forces” appears at the bottom of each license plate. For each set of DV plates issued, the applicant may also obtain a disabled parking placard. The Application for Persons with Disabilities Parking Placard and/or License Plate, Form VTR-214 is not required.